Donald Trump and his inner circle step up their intervention over the UK’s Brexit departure from the European Union — and possibly seek to replace British Prime Minister Theresa May. The latest step in the campaign is an opinion piece, ostensibly written by Donald Trump Jr., in Tuesday’s edition of London’s Telegraph newspaper. The opinion blares, “Democracy in the UK is all but dead.” It is a lengthy blast not only at the Brexit negotiations — reflecting the desire of Trump’s camp for a “hard” UK withdrawal from the EU, or even a No Deal — but also at May. May said after Trump Sr.’s July declaration that his advice was to “sue the EU [and] not go into negotiations”. Trump’s leading economic advisor Peter Navarro has also favored a sharp UK break with the Europeans, opening the way to Anglo-American negotiations. Critics say the Administration will seek to strip UK regulations in areas such as agriculture and the environment, and will try to open the way to privatization of the National Health Service and other public institutions. Trump Jr.’s intervention is the latest manifestation of maneuvers by the Trump camp since early in the Administration, hoping to use Brexit as part of the limitation and possible break-up of the European Union. Trump’s first nominee as envoy to the EU, Theodore Roosevelt Malloch, is an advocate of the dissolution of the bloc. Malloch’s personal issues prevented his confirmation. However, White House chief strategist Steve Bannon, a self-professed foe of the EU, pursued contacts with anti-EU and hard-right European parties. Central in those contacts is Nigel Farage, the former leader of the pro-Brexit UK Independence Party. 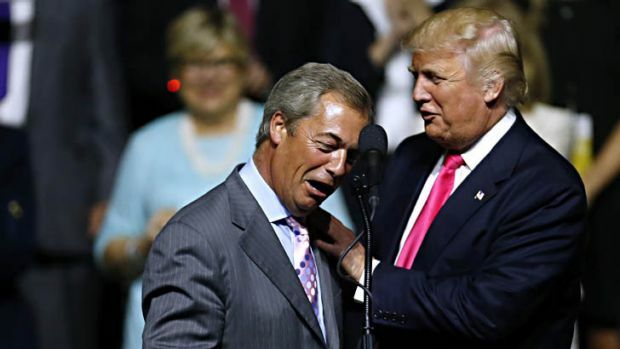 Farage joined the Trump campaign in summer 2016, making appearances at US rallies soon after June’s Brexit referendum and — allegedly — serving as a contact with WikiLeaks founder Julian Assange as the organization helped Trump by posting anti-Hillary Clinton material stolen by Russian intelligence. Farage, who has continued his mission through a London radio show and speaking engagements, has been trying to convince EU countries to accept a No Deal Brexit. Earlier this month he reportedly met Trump and his top advisors. Trump then said on Thursday at the White House appearance with Varadkhar for St. Patrick’s Day, that he was “surprised at how badly” the Brexit talks had gone, pinning blame on both the EU and May. Just before arriving in the UK in July 2018, Trump not only chided May’s supposed weakness but suggested that her rival Boris Johnson — who had just resigned as Foreign Minister in opposition to the Prime Minister’s proposed deal with the EU — would be a “great Prime Minister”. Former White House strategist Bannon, still close to the Trump camp, set up a London headuqarters during the Trump visit. He reportedly met representatives of both Johnson and Farage, and appeared on the latter’s radio program to call for the EU’s break-up.